I have been doing lots of sewing, but it’s been cold and dark, so opportunities to photograph it have been few and far between, so I’ve got nothing to actually show you, though I do have tons of completed things. Since I don’t have any of my own sewing, let’s admire someone else’s beautiful handiwork. 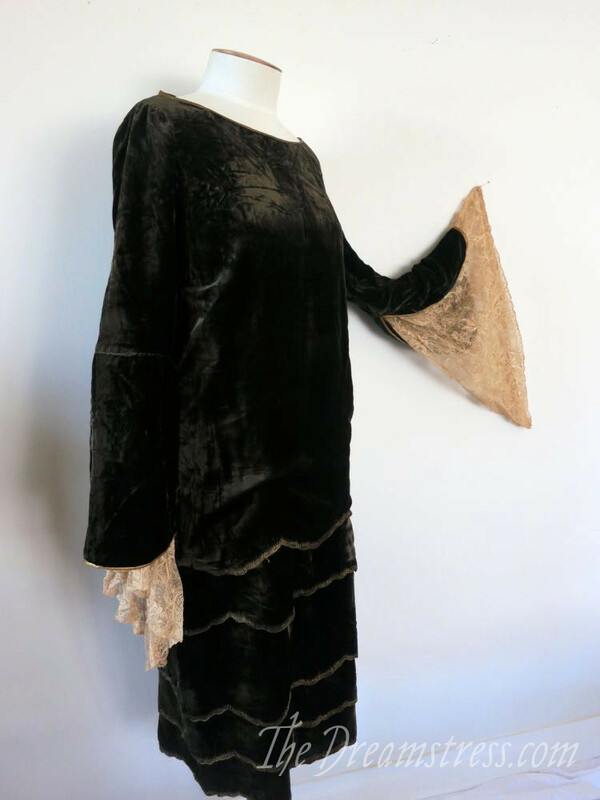 This fascinating 1920s tea dress was a gift from the wonderful Karen, along with the gorgeous blue velvet ’20s frock, and the swoon-worthy yellow negligee. This dress isn’t as visually spectacular in photographs, but as a study piece it is fascinating. The top part of the under-dress is a simple chemise shape in silk habotai. The silk habotai is sadly very fragile, especially where it has been exposed to sweat, but the construction is still quite interesting. You should just be able to see the darts extending down into the bodice over the bust, snugging in the bust-line. 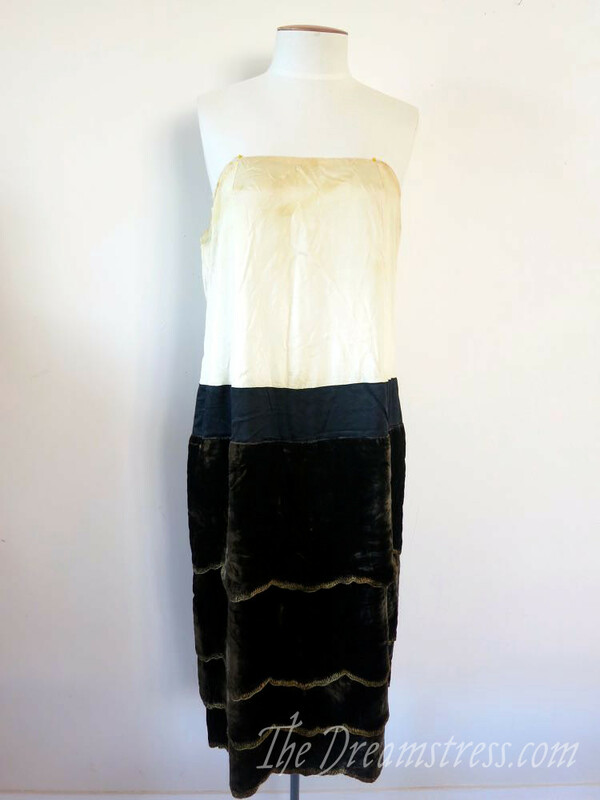 The skirt itself is tiers of silk velvet, joined to a silk crepe support piece. The tiers are cut in scallops, and hand-finished with heavy metal threads. I’ve examined quite a few 1920s dresses with embroidery in very coarse metallic thread. 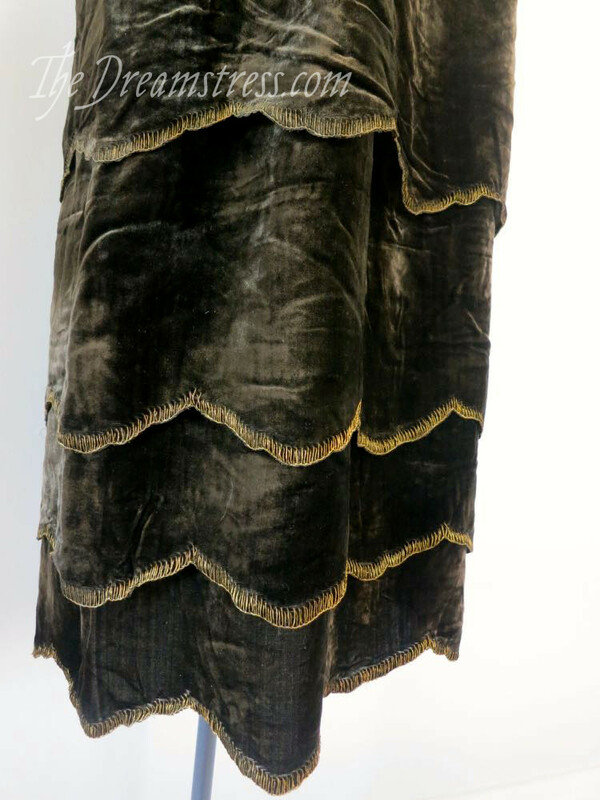 The embroidery, whether all metallic, or combined with coarse silk threads, often looks like a toned-down, more conservative way to incorporate fashionable avante-garde trends like fauvism and the Ballet Russes (as in this Goncharova dress for Mybor). 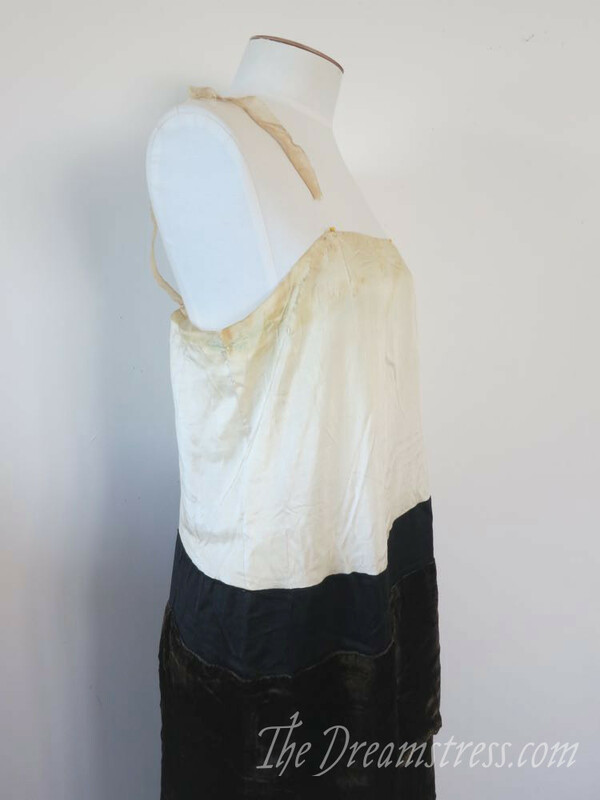 This dress is a particularly conventionally acceptable take on the trend, and, of course, metallics were extremely popular in the ’20s. The piping continues up the open back slits of the sleeves, and provides a sharp contrast to the soft silk lace of the sleeve ruffles. Every one knows that a tea-gown is a hybrid between a wrapper and a ball dress. It has always a train and usually long flowing sleeves; is made of rather gorgeous materials and goes on easily, and its chief use is not for wear at the tea-table so much as for dinner alone with one’s family. It can, however, very properly be put on for tea, and if one is dining at home, kept on for dinner. Otherwise a lady is apt to take tea in whatever dress she had on for luncheon, and dress after tea for dinner. One does not go out to dine in a tea-gown except in the house of a member of one’s family or a most intimate friend. One would wear a tea-gown in one’s own house in receiving a guest to whose house one would wear a dinner dress. – Emily Post, Etiquette in Society, in Business, in Politics, and at Home, 1922. The shorter skirt of this frock makes it an afternoon tea gown – for entertaining at home in the afternoons. 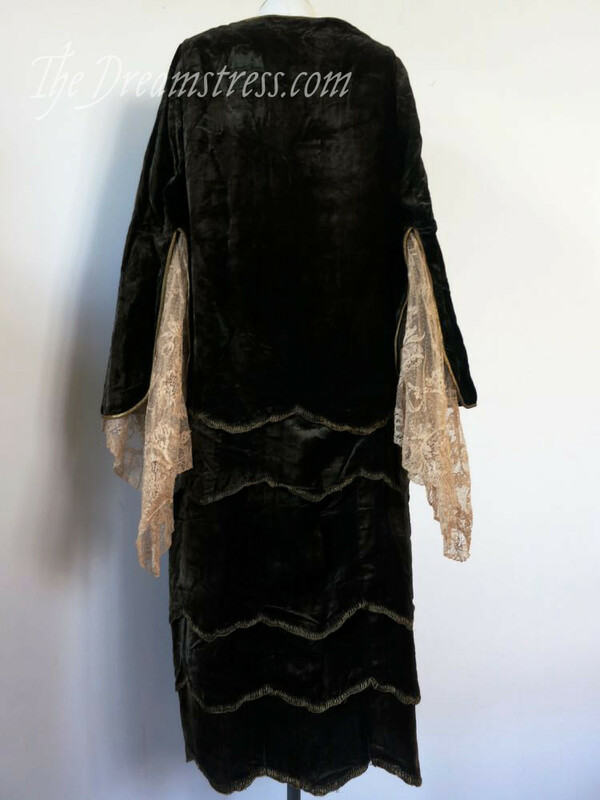 In the 1920s tea gowns to be worn for dinner or informal evening entertainments would be full length, even when a formal evening dress could would be calf-length (at their shortest, unless you were the Paris Hilton/Lady Gaga of the ’20s, hem lengths were never shorter than high calf). While all the exterior work on the gown is quite elaborate and precise, the interior finishes are very simple – just a widely spaced hand whipstitch, to prevent any extreme fraying. I’m so delighted to have this in my collection. Thank you Karen! It is lovely and I enjoy the addition of Emily Post’s description of when it should be worn. 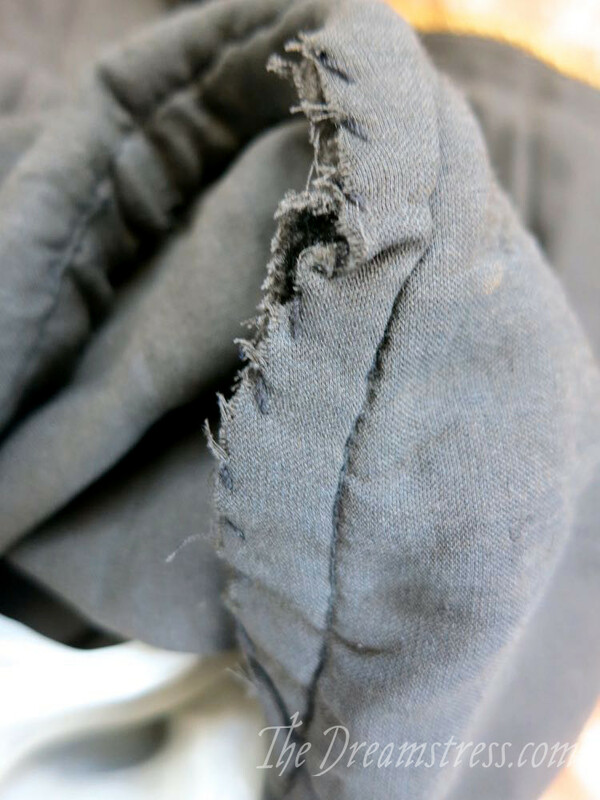 Are all of the main seams hand stitched? In the close up of the finishing inside it appeared so. I love the velvet, though its color has faded. The hanging lace ruffles do not appeal to me, but the rest is a simple, comfortable, elegant dress, much different than the Victorian era equivalents. 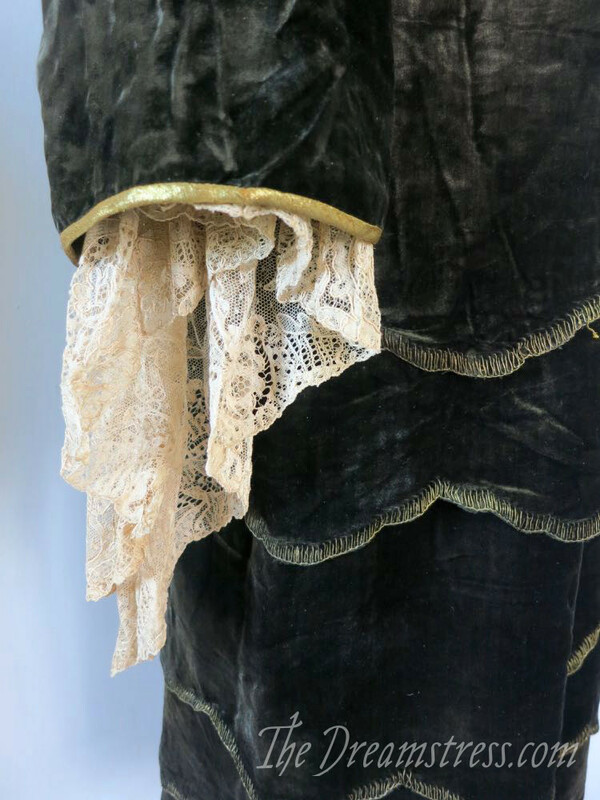 It does look faded in the photos, because that was the only way to get it to show any details, but in reality, it’s not at all faded – there are protected areas covered by the layers of fabric, so I can see that it hasn’t changed at all, and the overall colour is a very true, rich, deep, chocolate brown. 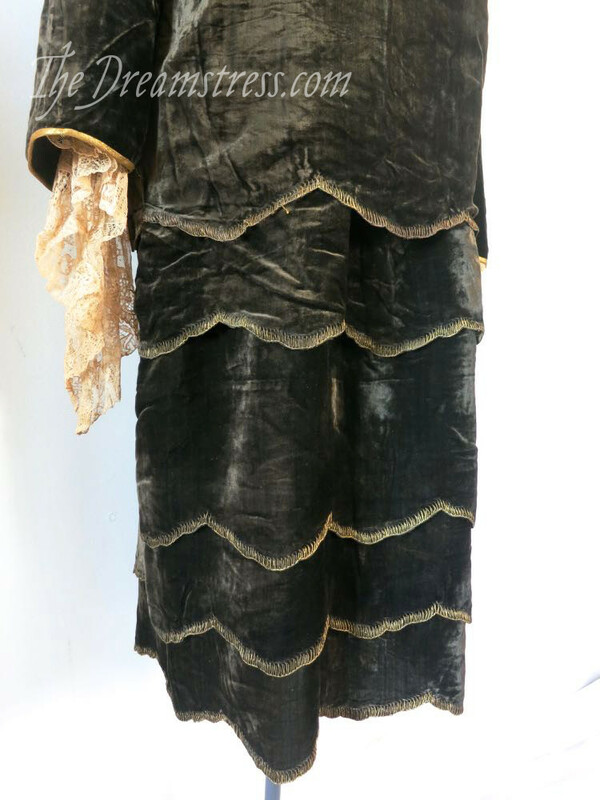 Brown was a very fashionable shade for tea gowns in the ’20s, and black was not, so it’s not a case of overall colour change either. What a gem! I really like the lace. Isn’t the lace fabulous? Modern lace just pales in comparison. It’s gasp-worthy! 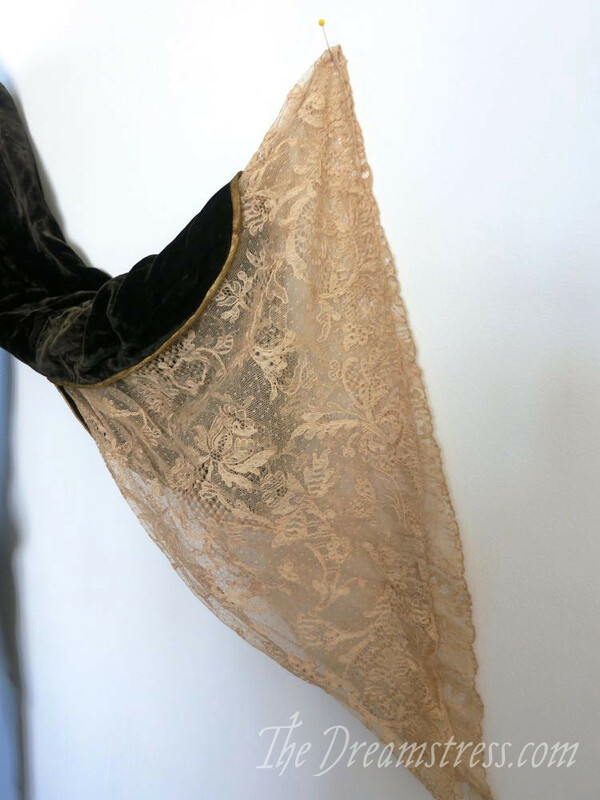 I like the trailing lace in combination with the slit – it makes it look almost conservative when you have your arms down, and then you raise them and – gasp! It also interesting how it’s made in two pieces. Thank you for the link…I had never seen draping done, this was fascinating. So glad you got to this one! I know how hard it is to photograph. 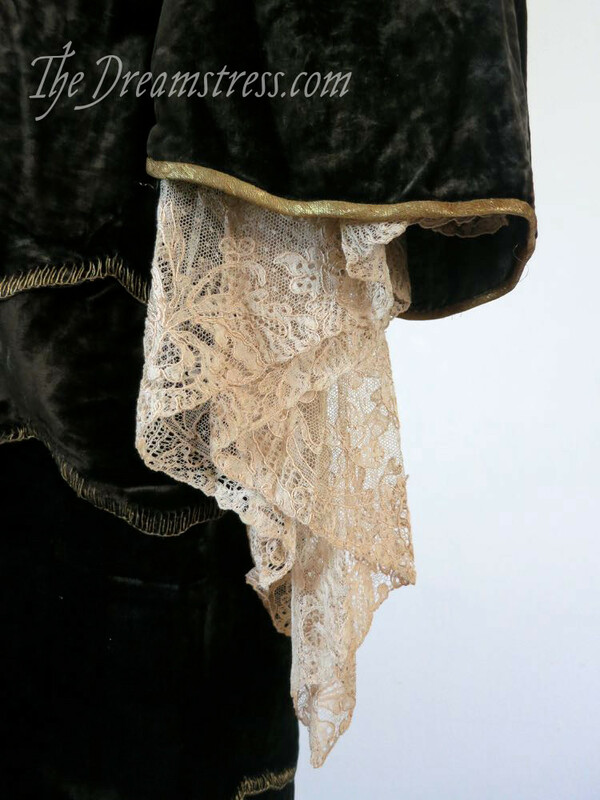 The lace on the sleeves always reminded me of the 18th century.